Multi-cultural events are happening at International Education Week November 18 thru 22 at the College of Southern Nevada including an important discussion on the United States and Mexico global water shortage. The United States and Mexico share a 2,000-mile-long border. 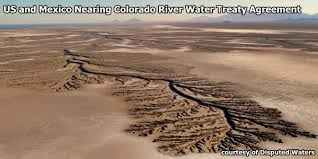 The use of the rivers, Colorado and Rio Grande, has become an intense and competitive issue as allocation of the waters is complicated with a finite water supply and many users in both countries. The Global Human Rights Initiative, along with professors at CSN, will discuss this issue at the event. Robert O’Meara, advisor for the College’s Global Human Rights Initiative, says the topic was chosen this year to raise awareness of the water crisis happening not just globally but locally. The Cultural Dialogue will take place Thursday, November 21 at the CSN’s Charleston campus in room K101 at 5:30 p.m.